View More In Fiber Optic Lights. ◆Please note that the back battery cover need the Screwdriver to open it,but the package doesn't come with the screwdriver. ◆Products made by diameter of 0.4MM optical fiber, optical fiber is environmentally friendly materials. ◆To avoid high temperature exposure◆Because the fiber is a plastic fiber, high temperature easy to make fiber optic cable deformation and affect the appearance of the product. Suitable for the temperature of -10 degrees to 30 degrees. ◆Remove the battery while nonuse◆ In order to avoid the battery power consumption, but also easy to cause corrosion of batteries, rust. 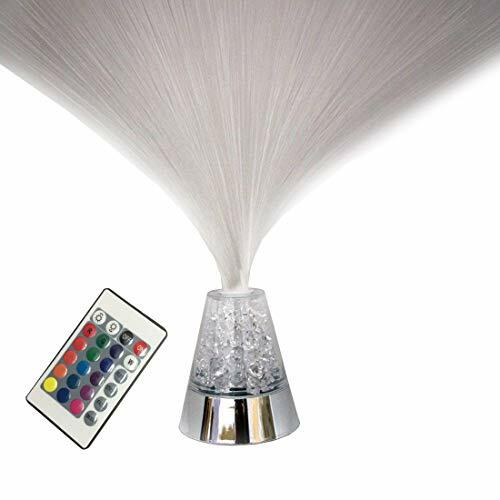 ★ The fiber optic lamp with remote control operation, and we can control 16 different lights and brightness by remote control. ★ This is extremely amazing item to decorate your living room, bedroom, kitchen and so on. It will surprise you, because it makes your room more colorful. It will increase the activity of infinite vitality and color and make people more happy. ★ It is very suitable to send it to children, family, friends as a nice gift. Use this pretty items during wedding, Christmas party, holiday celebration. Suitable for toys, promotional items, souvenirs, gifts, living room, office decoration gifts. ★ SATISFIED CUSTOMER SERVICE: If it has any production failure. please.let us know and we will send you replacement, refund, or whatever you request. If you have any questions about this product by Lianya, contact us by completing and submitting the form below. If you are looking for a specif part number, please include it with your message.